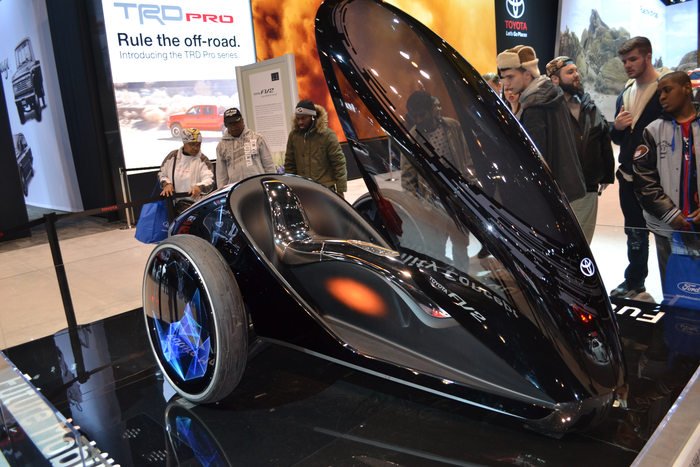 Though the cars are undoubtedly the stars of the show, the Chicago Auto Show is also a place to celebrate and showcase the latest in engineering and technology in the automotive industry. Remember all those cool cars you may have seen in big-budget, blockbuster sci-fi movies? Well, those ideas of new forms of transportation are right around the corner. And while we won’t be putting highways in the sky just yet, we are certainly closer than ever before. 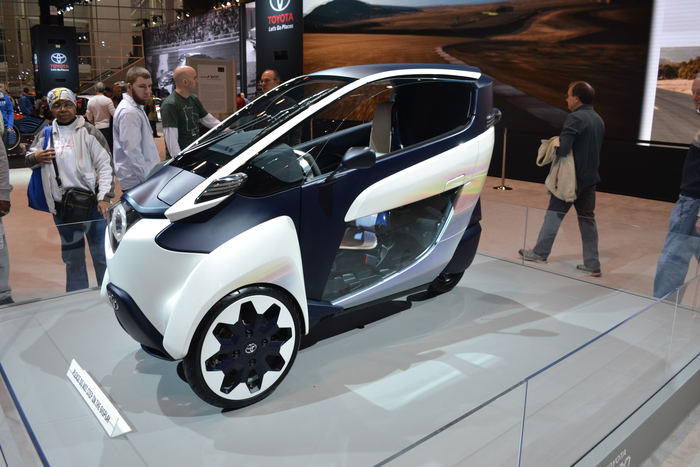 The i-Road is a unique three-wheeler that was designed to combine the styling, size, and maneuvering capability of a motorcycle or moped with the comfort and protection a car. Supposedly, the vehicle will offer a novel riding experience through its “active lean” system. 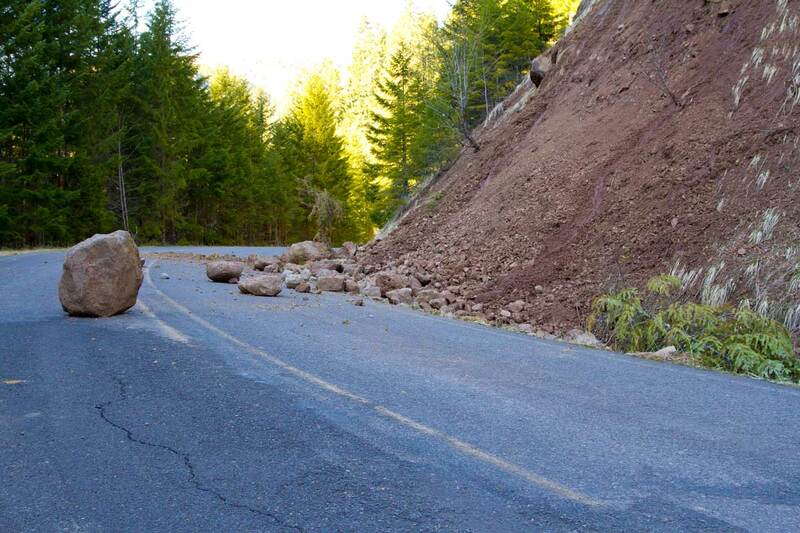 What that entails is the same type of maneuvering as a bike but with the stability of a 4-wheel vehicle, it would be like being one with the car. Since it has a closed cabin, passengers don’t need a helmet and are shielded from the outside. Measuring at about 870 square-millimeters, this is an ultra-compact vehicle that seems tailored for congested roads and urban obstacles and only takes up about 1/4th of a typical parking space. Gearheads may not be a fan of its quiet electric motor, which is powered with a driving range of about 50 kilometers on a single charge and is near-silent, however more environmentally-conscious techies might appreciate the fact that it produces zero emissions while running. And while it’s still technically a concept, it has been given a trial run on public roads in Japan, where it used Toyota’s new urban traffic system technology (which links vehicles to road infrastructure) and it was also given a run in Grenoble, France. 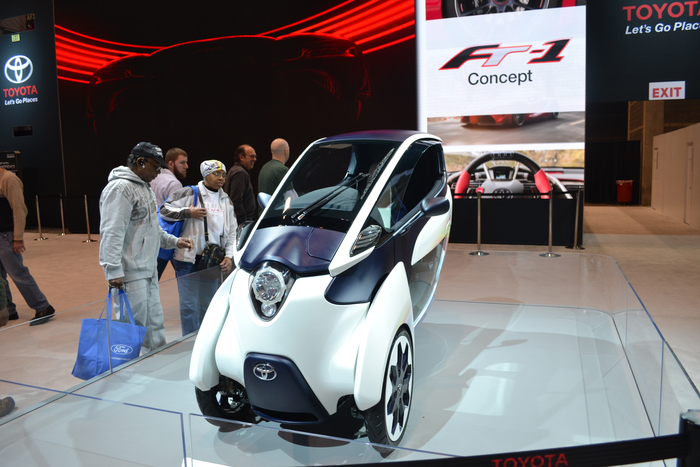 Toyota’s future mobility concept vehicles (the PM and the FV2) seem brought to life from fiction. Looking more like a cross between a bobsled and one of the “light cycles” from the Tron films, these vehicles are more like high performance Segway scooters rather than cars. The driver/user actually stands in and controls the vehicle almost like a scooter. There’s supposedly a holographic display and various computer gadgets inside, few of which were shown beyond its gorgeous head-up display. These are definitely slick looking machines, but it remains to be seen how something like this could be used on roads, though a future where people hover around on these would look cool, it’s difficult to imagine how practical this would all be. Moving around in the future will undoubtedly be interesting but another highlight was the amazing mobile technology and systems being integrated into vehicles. What was once reserved for luxury cars (GPS, Bluetooth, media players, etc) are increasingly common in standard consumer-available vehicles. Apple (yes, THAT Apple) was rumored to be showcasing their smart cars but what they did show was what they call “Apple CarPlay.” This is technology that will integrate people’s smart phones and tablets as automobile touch screens. These screens will mirror users to access their apps, music and data. And will even read text messages out loud and take dictation for replies and information such as sports/game score updates, calendar scheduling, and movie times. This technology was expected to launch around 2014 but the software is now being rolled out this year with one of the first adopters being the latest Hyundai Sonata, which was shown at the Chicago Auto Show. Honda, Jaguar, Mercedes, and Volvo have all announced plans to offer this software within the next two years. To prevent Apple from monopolizing this tech, Android has come up with their version as well.”Android Auto” will also be available in 2015 Hyundai Sonatas (which was a smart move on Hyundai’s part, allowing buyers to not have to commit to one platform or another for the lifespan of their car). The difference lies in the type of media streaming technology already made native to Android Auto. In the middle of Android and Apple vying for space in your car like they did for your phone & tablet, nearly every other vehicle manufacturer is making all sorts of mobile communications and entertainment technology the new standard for vehicles. Getting excited over a DVD player in your car is now a thing of the past. Even less gadget-savvy drivers have things to be excited about too, with all sorts of innovation making its way to the engineering of these cars. 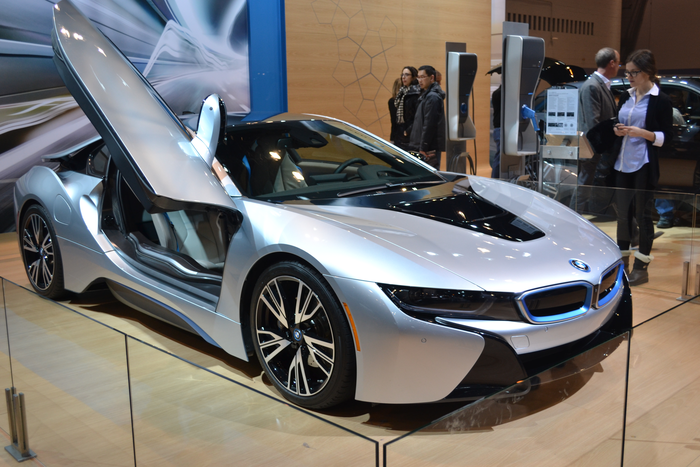 The BMWi8 may be a hybrid vehicle, but it pushes the idea of what a hybrid can really be. It’s a supercar. Its sharp, lightweight & aerodynamic design (with stylish gull-wing doors reserved for supercars) allows the fuel-efficient engine the capability to reach upwards of 160mph with just 357 horsepower. This is the luxury “green” car of the future (even if it’s sold out for the foreseeable future). 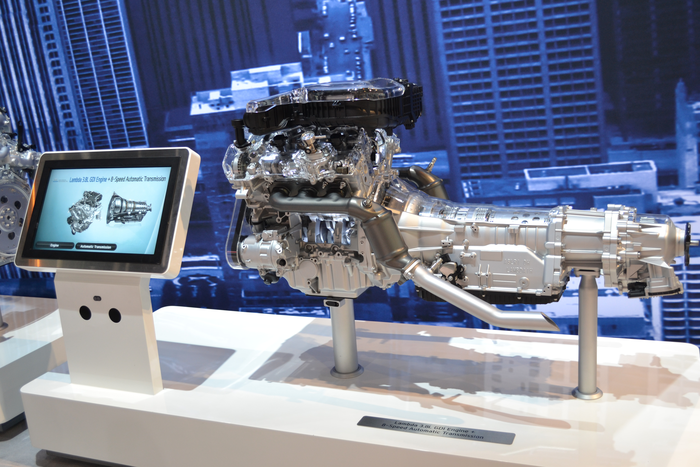 Aside from that, Hyundai stole the show again after announcing its new software by showing off refinements to their trademark “Lambda” engine, tweaking its power & performance along with its fuel efficiency. In fact most vehicle manufacturers were really pushing that this year more than most. “Power & Efficiency” were the hot keywords of the event, as more consumers have begun adopting more “green-friendly” vehicles which are known for their efficiency but not performance, it’s interesting to see vehicle manufacturers work towards a way to sacrifice neither. 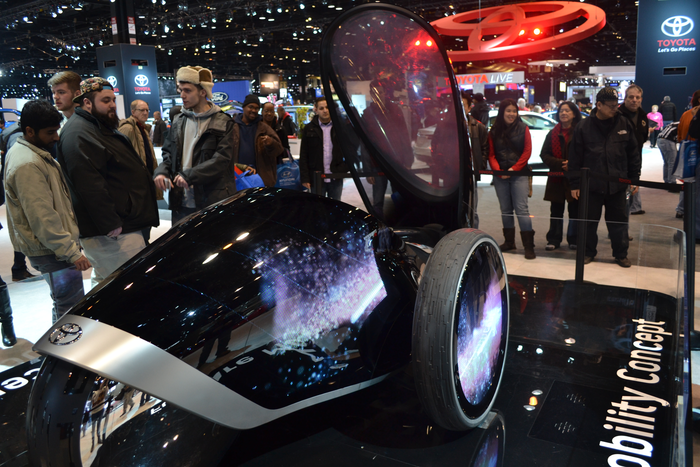 All in all, people interested in the possibilities of technology certainly had much to see at the Chicago Auto Show, beyond promotional gimmicks like such as conceptual designs. We really are living in a brave new world and it happened in subtle yet powerful ways from mobile technology to engineering innovation. 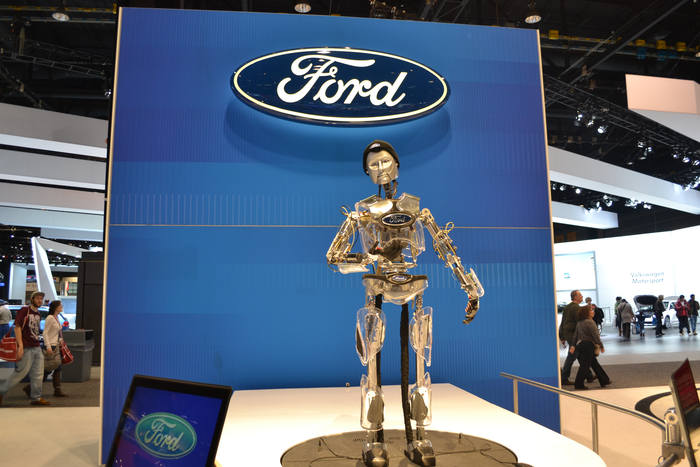 If there was one piece of technology that really stood out during our visit to this year’s show, and not necessarily in a good way, it was Hank – Ford’s interactive and extremely creepy robotic spokesperson. While the ability to interact with this machine and ask questions/receive answers in realtime, we think that Hank would be better suited haunting children’s nightmares rather than making another appearance at next year’s show.